The Collins Depot, or Gulf & Ship Island Railroad Depot, was built in the late 1800’s-early 1900’s. The Depot was modified over time, resulting in the removal of several original interior and exterior features. Through a matching grant from the Mississippi Department of Transportation, the City of Collins was able to purchase and renovate the Depot for use as a community meeting and special event space. The Depot restoration included new ADA Restrooms, a Kitchenette and reconstruction of the ticket offices. The non-original additions were removed, the overhangs were restored, and a west bay window discovered on a historic site map was reconstructed to match the east bay window. A new cedar shingle roof was installed with copper brackets, and new lighting, signage, and paint colors helped provide the building with character appropriate to both Downtown Collins and the Depot’s historic stature. The site was developed to benefit downtown Collins: providing parking, a retaining wall, stamped concrete courtyard, historically appropriate wood loading dock/porch, new sidewalks and landscaping. The Depot has been given a “new life” and will serve as a historic icon for the City of Collins for years to come. The original structure of Jack’s was a single-family ‘shotgun’ house built across the tracks in downtown Pascagoula that was moved around 1920 to its current location and became a jewelry store. Years later, a modern glass and metal façade replaced the front porch, and the building hosted a furniture store from 1948-1978 followed by a paint store from 1979-2005. The aging building received little attention following Hurricane Katrina until a local family recognized the ‘diamond in the rough’ and purchased the building in 2009. After a complete overhaul, retaining as much period-correct details as possible and adding a little whimsy of their own, the Garrison family (Mark, DJ, Holiday & a dog named Jack) opened Jack’s by the Tracks. Described as “a unique social, musical, and culinary experience” Jack’s includes a Southern sushi bar, juke joint, fish taqueria and neighborhood pub & deli. This award recognizes the best single façade renovation project that enhances the commercial district in appearance or function and encourages further design improvements. In 2009, Port Gibson Main Street, Inc. purchased the badly deteriorated J. H. Lee Building from a local church that had inherited the building from one of its members more than three decades earlier. Located in the 600 block of Market Street, the circa 1840 building is in the heart of the Main Street District and was the only building in that block that had not been restored or renovated. With the threat of demolition, Port Gibson Main Street agreed to purchase the building after hiring a structural engineer who inspected and determined the building could be saved. In 2010, Port Gibson Main Street spent approximately $50,000 to structurally stabilize the building and reinforce the second story. In 2011, PGMS decided to improve the appearance of the building by working on the façade, which was not original to the building. Consulting with a contractor and Randy Wilson, MMSA’s Director of Design Services, a plan to clean up and improve the façade was developed. The façade work was completed in October 2011 at a cost of approximately $10,000. This is the fourth building that Port Gibson Main Street has purchased and renovated in an effort to encourage private property owners to make improvements to their own buildings. The prior projects were complete restorations, which have been sold to private investors and returned to the City’s tax roll. This award is presented to an individual or business that has completed an outstanding private historic rehabilitation project that maintains the use of the building in a downtown district. The evolution of the Old Pascagoula High School into Bayside Village Senior Apartments is a 12-year saga and an example of what vision, foresight and perseverance can accomplish. The Old Pascagoula High School was constructed in 1937-38, and opened in January 1939. The original school, hailed as the ‘most modern and complete high school unit in the state’ served the community well for 58 years and was occupied until January 1997. The building was designated a Mississippi Landmark in 1999, and the same year, the property was sold for $150,000 to developer Steve Nail of Intervest, who had plans for a Senior Housing facility. In 2000, the building was placed on the National Register of Historic Places. In 2001, after 9/11, funding for the project evaporated and the property reverted to the School Board who placed it with a realtor and listed the building for $2 million. What was a deteriorating brick building is now a beautiful development consisting of 57 one and two bedroom apartments, ranging in size from 379 to 1287 square feet. All of the original windows were retained, with the help of MDAH, who encouraged the developer to speak with several restoration companies and found that restoring the original windows would cost about half of the price of purchasing new ones. The project included repainting all exterior bricks, and replacing the damaged bricks as well as converting classrooms into attractive apartments, retaining the wide corridors and old lockers. The overall cost of the project was approximately $57 million, and the whole community is the beneficiary of the major landmark that has embarked on a new life as affordable housing for senior citizens. This award recognizes excellence in signage design, craftsmanship, creativity and overall impact on its building or entryway, or directional signage to the downtown. Bill Warren paints signs. The Sunday Memphis Commercial Appeal said Warren’s signs have “changed the appearance of Water Valley through his custom hand-painted vintage-style signs.“ The New York Times cited Warren’s sign work, along with new creative business owners in Water Valley, as “civic cross-pollination”. Closer to home, the Oxford Home Guide featured three of Warren’s signs on the front cover. And at home, Warren’s civic and commercial efforts are regularly chronicled in the Water Valley newspaper. Through his artistic eye for detail and design, precise attention to calligraphy, and his keen sense of color and scale, Warren has literally re-signed Water Valley’s downtown revival. A graduate of the Rhode Island School of Design, Warren believes that hand-painting signs is a skill worth preserving, adding character to downtown and returning not only the historical style, but also adding whimsy and nostalgia. With proper lighting, the hand- painted signs are able to out “pop” even neon or illuminated plastic signs at night. Warren’s commercial work now adorns 15 businesses and can be seen on everything from façade signs and lettering on storefront glass to small aisle and directional signs. His numerous civic signs, many created pro bono, adorn the local museum, Farmers Market, and local churches, while his skilled hand-drawn posters are seen promoting every downtown event. When residents now say the downtown looks better, but still genuine, they are talking about Bill Warren’s signs. A result of vision, volunteer service, community support, and individual and corporate donations, a dark, blighted lot on Court Street is now a beautiful pocket park named the Haire Wealth Management Green Space. Historically, the vacant lot was once a very important utility site for Downtown Tupelo but was now closed and abandoned, leaving the area with need for improvement. Shipman Sloan of JBHM Architects looked across the street from his office and had a vision of transforming this vacant lot into a usable and attractive “pocket park”. With this vision in mind, he designed a unique space that includes public art, casual seating and a number of “green” concepts. The original estimate for the total cost of the renovation was $50,000. Haire Wealth Management quickly committed $20,000 for naming rights to the space. This contribution, along with $10,000 in grants from Tupelo Quality of Life and Waste Management/Keep America Beautiful, as well as donations from private citizens and corporations turned the design concept into reality. In kind donations from B&B Concrete, JBHM Architects, Engineering Solutions, Inc. and Tupelo’s Public Works Department helped reduce the original cost estimates. The community rallied around this project from day one by giving financially and volunteering their time. In the early process of excavation, a number of bricks were found that were repurposed in the design project to retain the historical value of this site. Additionally, the landscape features plantings native to North Mississippi. Now, the once vacant lot is a bright, vibrant green space providing a welcoming backdrop for many events and gatherings in downtown. Awarded to the downtown organization that has created and implemented the best retention and/or business recruitment program for its downtown. After much study and discussion, the Meridian Main Street board and ER committee determined that people living downtown foster the support for more retail and service businesses. Consequently, a downtown residential development initiative was included in the MMS program of work. Meridian Main Street engaged the MSU Strategic Business Consulting class to explore existing downtown housing as well as the current demand for more downtown residential development. Their study revealed approximately 97 percent of downtown rental units were currently occupied, and many property owners had a waiting list of potential tenants. Meridian Main Street took action by conducting a Downtown Residential Development Workshop, which highlighted the importance of downtown residential development and the potential for profitable investment. The workshop included tours of existing downtown residential projects, presentations by successful downtown developers, case studies on similar successful endeavors, panel discussions, and a presentation of the Downtown Meridian Apartment Study. The event corporate sponsors included: MDA’s Asset Development Division, BankPlus, Community Bank, Great Southern National Bank, Meridian Lauderdale County Tourism Bureau, MidSouth Development and Trustmark Bank. The workshop was well attended by the target market and a variety of downtown residential development projects are now underway. Downtown Meridian currently has 149 residential units; four new units should be open within weeks and more than 40 units in five different projects are currently being developed. With the influx of downtown residential units, new and expanded food, beverage and entertainment venues are opening downtown. Granted to an individual or business that has undertaken a new development project within a downtown district that not only achieves financial success and quality design but also has made a positive impact on downtown revitalization. Anchor Square is a collection of 16 Mississippi Cottages originally used as temporary housing following Katrina that have now been repurposed into a specialty shopping village in the heart of downtown Pascagoula. In 2008, Mississippi Main Street brought a team of planners, economic developers, architects, and designers to downtown Pascagoula to offer practical ideas for reinvigorating downtown that could be implemented quickly and effectively. The resulting recommendation was a “cottage village” where several soon-to-be retired Katrina Cottages could be arranged in a pleasant shopping environment. The City of Pascagoula was quick to embrace the idea and partnered with Habitat for Humanity and set to work securing the 16 cottages on a key block located between the waterfront and downtown. With funding from the Gulf Coast Community Foundation, Habitat engaged volunteers from around the country who worked tirelessly on a stunning boardwalk that connects the cottages and creates a dynamic outdoor space centered on a “village green.“ As the cottage village began to take shape so did plans for recruiting tenants. The City of Pascagoula and many local partners held a forum for more than 40 interested entrepreneurs. Attendees submitted business plans and applications for a cottage space at an affordable rent. All of the proceeds from rent would go back into the village for promotion and maintenance. The idea that the cottage village would serve as a retail “anchor” to downtown led to the name “Anchor Square”. Anchor Square hosted its official grand opening on August 18, 2011. To date, 12 new businesses have opened and three more will be awarded shortly. These businesses include gift shops, skin care services, bath and body products, a photography studio, hair salon, clothing and accessories, a German café, and a barbeque restaurant, and employ more than 25 people. Anchor Square has now been the host of three football pep rallies, a “Second Saturday” music series, and an ice cream social and is already becoming a hub for community activity while fostering small business growth for the City of Pascagoula. This award recognizes excellence in the retail field and goes to a merchant who has been a “mover and a shaker” in downtown revitalization and exemplifies the best in merchandising, inventory, display, hours, quality, convenience and service. Main Street Clinton has been fortunate to have the support of many of the downtown merchants, both through their membership and committee participation. One such merchant, Toni Wall, owner of Pentimento Book Store, has been a vital part of the Main Street Clinton program since it began in 2007. Toni opened Pentimento Book Store in 2005 because of her love of books and other book lovers. With a focus on vintage books, signed first editions, southern writers and children’s books, Toni quickly gained a loyal following. Pentimento’s attractive storefront invites customers to experience southern hospitality at its best. Once inside, customers can relax into a comfy sofa and read while enjoying a wonderful ambience. When Clinton entered the Main Street program, Toni quickly became involved with the Promotions Committee helping to plan downtown events. With her quick wit and creativity, Toni was the “go to” for event names and unique concepts. The Caterpillar Parade was her “brain child” when the committee was looking for an event to tie into a spring Earth Day activity. In 2009, the Promotions Committee named her the first Caterpillar Queen, a title that she embraced with enthusiasm. Toni excels in merchandise displays changing out the store window seasonally and thematically to coordinate with Main Street events. Toni sets the bar high for other downtown retailers because of her vision and level of commitment to Olde Towne Clinton. With “Postcards & Pizza” the Water Valley Arts Council promoted the new back dining room of Rounder’s Pizza Deli, brought art lovers out on a cold winter night, energized local artists, and raised funds for the annual ArtCamp for Kids. Hundreds of handmade post cards clipped to hanging battens were the backdrop and focus of the evening. The call for postcard art went out via electronic and print media, and artists and non-artists alike were invited to participate. The concept was to make a piece of art on a 4x6 card that was tough enough to be mailed and interesting enough to be a work of art on its own. “Make it, donate and support local arts” was the message. Thirty artists responded and 220 cards flooded in. The evening fun consisted of picking one card or many, buying pizza, hearing some music, enjoying downtown and meeting local artists. By never repeating a successful fundraising concept, the WVAC keeps the creative energy and event anticipation going. The $1,250 raised was plenty to fund this year’s summer ArtCamp. The WVAC events continue to place “the arts” as the creative economic catalyst in this town’s revival. This award is granted to the downtown organization that underwent a successful capital fundraising campaign. The capital campaign brochure is a highly creative piece giving a subliminal nod to the timber industry that was the mainstay of Laurel’s economy, growth and branding as a lumber town. The doors on the printed piece actually open to reveal the accomplishments, events, and Main Street Four Point Approach to business and development in downtown. The brochure designer, Erin Napier of Lucky Luxe Couture and Correspondence, along with members of the Capital Campaign and Economic Restructuring Committees, effectively tied Laurel’s roots to the LMS brand. The clear and concise content in the brochure gave funding prospects accurate data as to the significant role LMS plays in downtown development. Seven downtown residences were also added to the developments within the time period noted. The “What’s Happening?“ section listed all events and projects promoted by LMS and were a quick guide to where resources are spent. The Capital Campaign netted $13,500 and received three-year commitments for $1000 - $2,500 from a total of 12 corporations, seven of which had not pledged or contributed in the past. The LMS Board and capital campaign committee conducted this campaign while under an interim director, marking this Main Street organization as highly effective and dedicated to its mission. This award recognizes the downtown organization that has developed a creative promotional piece that serves as an effective downtown directory to visitors and tourists. Tunica Main Street’s brochure is a beautiful information piece mailed out to visitors and available all over north Mississippi. Local Tunica businesses keep a supply of brochures for tourists and they can also be found in North Mississippi Visitor Centers as well as local tourist attractions, including the Convention and Visitor’s Bureau, Battle Arena, and Tunica River Park. Created by Amber Lombardo of Webz Media, the brochure features wonderful photos of Tunica’s downtown as well as maps and a business directory of all the businesses on Main Street and on the Highway 61 Corridor. An insert map is helpful to tourists and shows Tunica’s location in regard to other cities. The main focus of the brochure is to show Main Street Tunica’s true southern hospitality. Visitors are encouraged to spend a day in historic downtown and stroll the charming Main Street district where arrangements can easily be made for groups to browse shops, eat lunch, and tour museums. The publication effectively shows and tells all that Tunica has to offer. This award recognizes the downtown organization that has developed an effective public relations piece or promotional campaign that motivates the consumer and promotes community loyalty. “Open for Business,“ is a comprehensive destination branding promotion spearheaded by a 30-second pilot commercial that was underwritten and launched by the Downtown Tupelo Main Street Association in December 2010. The ad features business owners, employees and customers in downtown and conveys an atmosphere of eclectic shopping, quality dining and fun entertainment. The initial success of this pilot ad has leveraged additional cooperative television promotions, positioning Downtown Tupelo as a regional shopping and dining destination. This award recognizes excellence in communication by a downtown organization through its print or online newsletter. When Lorie Bryant became manager of Amory Main Street in 2010, she saw a need to improve communications with her Main Street merchants and members. She immediately began producing, printing and emailing the first Amory Main Street newsletter. Each newsletter and email blast communicates upcoming events, information updates and successes as well as provides free advertising for Main Street Business Members as part of their annual membership. Newsletters are produced quarterly and supplemental e-blast fliers are sent out to a growing number of individuals and business owners who are asked to forward on to their friends, thus increasing readership. Beginning this past Christmas, Lorie created an “Amory Main Street Shopping Guide”. By visiting Member retail businesses, taking pictures and getting information, Lorie was able to create targeted ads for each business. The pictures were added to Amory Main Street’s Facebook page and linked to the businesses, adding an additional buzz. The response has been very positive from the public, and businesses have reported that this free advertising has helped generate additional sales. This same idea was used to produce a “Fitness Guide” and “Valentine’s Shopping Guide” as well as promote upcoming Main Street events by specifically targeting individuals and businesses. Newsletters and e-blasts as well as shopping guides, advertising promotions and social media have helped increase awareness and create excitement about what all downtown Amory has to offer. A View From the Square is the Carthage Main Street (CMS) newsletter that goes out once a month to an email database of more than 300 people. The newsletter can also be found on the CMS website—www.carthagemainstreet.com. The newsletter is the advertising medium that CMS uses to publicize its events along with other events going on throughout the community. The newsletter was re-launched in July 2011 under new Program Manager Russell Baty. This award honors the downtown organization that has developed an effective tourism promotion that sells the downtown district and businesses. Everyone loves a postcard. Tunica has many visitors who come to town and want a little something that they can mail or take home. Tunica Main Street came up with the idea to have postcards printed and sell them at cost to downtown businesses. The retailers would then sell the postcards for a profit. The post cards have been very successful and provide an easy way to get visitors into the downtown businesses. The beautiful postcards were designed by Amber Lombardo of Webz Media. Each postcard depicts a scene of Tunica with descriptions of each landmark on the back. The postcards are sold in two sets of six and each one comes in a protective sleeve. The front card is a thumbnail view of all six images. When visitors ask about the postcards, Tunica Main Street directs them to the businesses in town to make their purchase. The postcard retail promotion project has been an effective means for bringing visitors to downtown, providing revenue to businesses, and offering a keepsake of Tunica’s favorite landmarks to visitors. Tunica’s story is spread across the state and country each time a postcard is mailed or given to a friend. After reading and hearing about Cash Mobs, Debbie Brangenberg decided this was a project for the DTMSA. Within a couple of days, the buzz was started. A logo was designed, Facebook and Twitter pages launched, and a presentation was made to the DTMSA Board of Directors. Using social media networks, the news of the Cash Mob spread very quickly. Within a week after its launch, the Facebook page reached 1,424 people prior to the first Cash Mob. Local media partners including NBC, ABC, FOX, and CBS as well as The North Mississippi Daily Journal that helped publicize the event. The initial business to “Mob” was selected by a random drawing of all businesses that were planning to open for Spring Open House. With an estimated 25-30 “Mobbers”, the first Cash Mob in Tupelo and the state of Mississippi proved very successful, creating an estimated $2500 in direct retail sales for The Main Attraction Emporium & Coffee Bar. The first “Cash Mob” was held in conjunction with National Cash Mob Day and will not be the last. The “mob” has drawn the attention of a local bank wanting to participate in the future by donating the cash for the “Mob”. Downtown Tupelo will continue every few weeks until all downtown retail businesses have been “Mobbed”. This award recognizes a person or event in a community that has displayed an involved commitment to downtown. In fall 2011, the entire Amory community pulled out all the stops for the largest Amory High School Homecoming Parade and community wide Pep Rally in downtown. In 2005, Amory Main Street began partnering with Monroe County and Amory School Districts for a Pep Rally in downtown Frisco Park to kickoff football season. Since then, the event has grown every year, bringing large, diverse crowds to downtown, and giving everyone a great since of community pride. In 2011, Amory’s Homecoming Parade was held in conjunction with Main Street’s Pep Rally in the Park, and the combined efforts of Main Street and the school district generated the largest crowd ever in attendance. Amory Main Street publicized the event in the Monroe County Journal, Monroe County Shopper, and local radio station. Cheerleaders were interviewed on WTVA, and e-blasts and fliers were distributed. The Amory School District made announcements for each grade and at home football games and used the district’s automated calling system to inform parents, students, faculty and staff. Amory Main Street’s volunteers and Amory School District’s High School football team, cheerleaders, dance team, coaches, and band, along with the Middle School’s cheerleaders and mascot, all participated in the pep rally. High school floats, the homecoming court and various community organizations also joined in the fun, including Amory’s Police and Fire Department. Main Street volunteers cooked and handed out 500 free hotdogs, sponsored by the Monroe County hospital. Before and after the event, businesses reported more foot traffic and restaurants got a big boost. The annual Amory Parade and Pep Rally brought everyone in the community downtown for a fun and uplifting time. This award recognizes the downtown organization that has created a quality special event focused on the arts that generating traffic for the downtown and promotes local talent and creative artistic endeavors. In 2011, New Albany Main Street developed an event that showcased the talent in the local community in all aspects of art, music and food. The event was held at In Bloom, a new reception hall in historic downtown. The evening included a juried art event, food from local restaurants and special music. Ten artists were chosen to display pieces of their art, and all was available for purchase. Artwork featured from the artists included acrylic paintings, oil paintings, painted furniture, and photography in a variety of subjects. A winner was selected by judges and presented with the “Best In Show” award. Ten local restaurants participated in the event, demonstrating their culinary arts and donating food and servers for the event. Jason Wilbanks provided entertainment on the classical guitar. Tickets for the event were $10, which included a tour of the artwork, food, drinks, and music. With 250 guests, this was a great opportunity for the artists to network, and several pieces of art were sold. Each artist and restaurant said they would love to do the event again, and New Albany Main Street is already planning and looking forward to growing Arts, Beats and Eats in 2012, and showcasing more local art in the community. This award recognizes the downtown organization that has created a quality holiday event, generating traffic for the downtown. Holiday Open House in Downtown Batesville is the perfect combination of tradition and family fun. The Batesville Main Street Program and the downtown merchants host the event each year on the weekend before Thanksgiving. Beginning on Saturday, vacant downtown buildings house the Christmas Bazaar. Arts and Crafts vendors join the local merchants in welcoming patrons to kick off the weekend activities with wonderful handmade items, tasty homemade treats, and other great gift items available for purchase. Holiday shopping continues on Sunday with the Christmas Bazaar and local merchants open their doors to welcome shoppers for special Sunday hours. In addition to shopping, the Holiday Open House provides plenty to get you in the holiday spirit. Carriage rides are offered through the historic downtown area. Each year, hundreds of children look forward to visiting the elves and Santa downtown. Santa’s elves have their workshop set up for little ones to write letters to Santa, make reindeer food, prepare a snack for Santa, and decorate an ornament for their Christmas tree. Each child receives a return letter from Santa. Santa is also available for photos and to hear Christmas wish lists. Holiday Open House has become more than an opportunity to begin holiday shopping. Groups of people gather and visit on the downtown sidewalks while children run and play in the downtown Memorial Park. Holiday Open House is a time for the Batesville community to come downtown, visit with friends and share in the spirit of the holidays. This award recognizes a creative and positive collaborative special event between the public and private sectors within a city or town. In 2009, the City of Cleveland obtained a grant to establish the Martin & Sue King Railroad Heritage Museum. The mission of the museum has been to preserve and promote the history of the railroad that gave Cleveland its beginning. The museum also showcases an amazing model train layout, completely restored by volunteers. With TV advertising, promotional videos, a brochure, Facebook page and articles in regional and state publications, word about the museum continues to spread. Exhibits focusing on various aspects of railroad history began in 2010, accompanied by opening receptions. Partnering with different groups such as the Bolivar County Library and Bright Beginnings, readings, exhibits and book signings have attracted people from all over the country. Annually, the museum hosts many groups and accommodates teachers, students, churches, and civic groups, and continues to find new ways to serve the community and bring exposure to the downtown. Working with Team Cleveland/Main Street, the museum offers extended hours for special events and has hosted “Young Artists”, Miss Mississippi, characters from the Nutcracker and offered Holiday Carriage rides downtown. The museum offers visitor information on “10 Things to Do In & Around Cleveland” and with the trains running six days a week, there is always a “special event” in downtown Cleveland! This award recognizes the downtown organization that has created a quality special event for Youth, generating interest and instilling a love for downtown in the younger generation. “Sweets and Treats on Main Street” was a first ever event in Carthage to bring trick or treating to the Square. The thought was to have Halloween on the Courthouse Square and bring kids to a central location that would be safe and controlled and relieve some of the overcrowding in the neighborhoods. Businesses from all over town as well as several of the large neighborhoods donated candy to the Square, helping produce a carnival atmosphere. To add to the excitement, a Costume Contest was held that had 100 participants in three separate age groups. To cap off the evening, Main Street sold hotdogs and chips and showed the movie “Casper.“ The event was a huge success with more than 1500 kids and 32 local businesses participating. In the end this was one of the most successful events that Carthage Main Street has ever had and plans are already in the works for Halloween 2012. This award recognizes the downtown organization that has created a quality parade that celebrates community spirit and playing downtown for all ages. In 2012, Main Street Clinton celebrated the beginning of the Olde Towne Market season with the 5th Annual Caterpillar Parade. The parade has become a community rite of spring, growing this year to involve between 350 and 400 children, parents, volunteers and furry friends. The parade was the brainchild of Promotions Committee members and Olde Towne merchant Toni Wall. The impetus for the parade is the iconic caterpillar playground equipment located at Lions Club Park. Festivities began at Lions Club Park, located in the heart of Olde Towne, with local thespian James Anderson reading The Very Hungry Caterpillar. Children were treated to complimentary noisemakers and colorful balloons and were invited to follow the 30’ caterpillar, like the Pied Piper, over the six-block route through Olde Towne. The parade consisted of the Caterpillar, bike riders, wagons and strollers, many decorated with butterflies and flowers, walkers, a drum corps from Mississippi College and the Caterpillar Queen. Rounding out the event, children were treated to a magic show, balloon animals, face painting, a bounce house and the opportunity to adopt a caterpillar cocoon, all compliments of Main Street Clinton. The creative and quirky parade has become an important event for Main Street Clinton involving many groups of volunteers working together to make the parade a memorable experience for the children. This award recognizes the downtown organization that has created a quality special event, emphasizing the food and culture of the local economy. After a six-year journey, Biloxi Main Street’s Grillin On The Green has become the premier barbecue competition on the Mississippi Gulf Coast. With over $5,000 in cash prizes, 25 professional grill teams and more than 12,000 event goers, Grillin on the Green is the leading springtime festival and has been selected as a “Top 20 Event in the Southeast” by the Southeast Tourism Society for three consecutive years. Grillin takes place each year on the Biloxi Town Green. It is held annually on the same date as the Hibernia Society’s annual St. Patrick’s Day parade. One could say that Grillin is “green” in name, place and date. Grill teams from four states converged this year to compete in categories of Best Ribs, Best Brisket, Best Chicken and Best Original Sauce. The competition is fierce but friendly. Judging is accomplished with the knowledgeable expertise of chefs from area restaurants and casino resorts. Trophies and cash prizes are awarded just in time for the beginning of the parade, which promenades around the Biloxi Town Green. More than 125 vendors showcase handmade arts and crafts and everything from jewelry and birdhouses to quilts and yard art. The children’s play area offers snow cones, inflatable slides and bounce houses and face-painting. Day long, live entertainment provides the setting for dancing and revelry! Event goers include local citizens, tourists and barbecue enthusiasts who travel from as far away as Atlanta and Birmingham to sample what Biloxi had to offer. Biloxi Main Street’s Facebook page and e-newsletter, “The Good News Gazette” has helped attract patrons far and wide, along with newspaper, billboard, radio and television coverage. The idea for the “Second Annual Community Sing-Along” seemed quaint, even archaic, and the name lacked zing. The core organizers were not your hip downtown crowd; all were solidly in their 70s. But the audience came. Betsy Person, a Water Valley transplant from New Orleans, firmly believes that community singing is the answer to bringing people together. The first Sing-Along was held in 2010 outside in City Park. For better sound, the second sing-along was held in the Hendricks Machine Shop building, an old railroad foundry turned Ford dealership, and a building recently saved from decades-long abandonment. Here, Betsy found the sound she knew the community had and unknowingly wanted. The mood and music had even the mayor dancing the hokey-pokey. A carpenter songwriter, an ex-hippie guitarist, a bluesy gospel singer, a church choir leader, and three slap rappers all had the crowd singing and sometimes on the edge of tears. This event was not the first, but one of a good and subtle Main Street pattern: a quirky fun-filled event driven with creative community energy that announces a building is back “in action” and leads to a flood of sale inquiries. The big goal is for a business to go in the building. Following the Sing-Along, Hendricks owner Bill McGregor had 3 lease proposals for the building this spring. Betsy will need another location for next year’s Sing-Along. 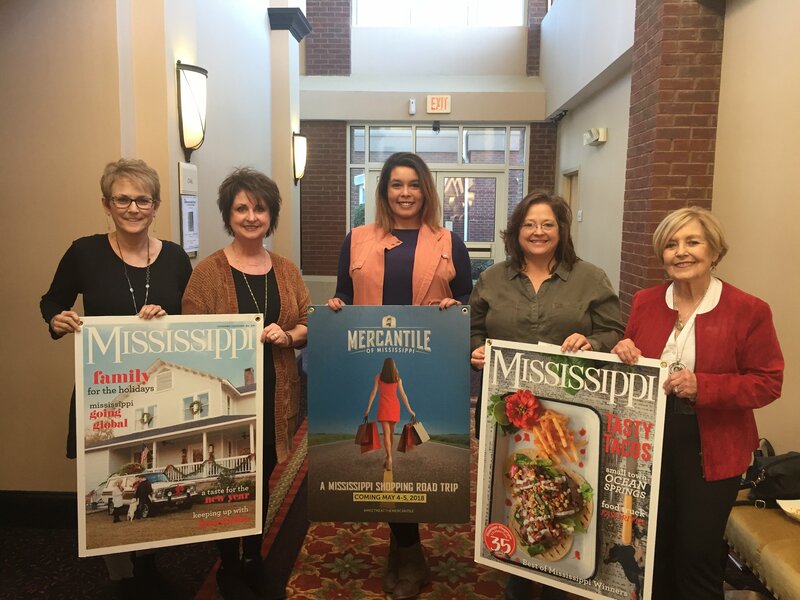 It is because of Mayor Rosemary Aultman’s vision and leadership that Clinton applied for and was accepted into the Mississippi Main Street Program. Mayor Aultman has shown a commitment to the revitalization of both the Olde Towne and Boulevard Districts of Clinton, and she recognizes that Main Street Clinton is a key economic development tool for the community. Her support for the program has gone beyond just attending events; she has participated in board planning retreats, served on the Olde Towne Market planning committee, emceed Red Carpet Roll-outs for new businesses and even helped decorate for fundraisers. On a weekly and sometimes daily basis, Mayor Aultman makes herself available for meetings to discuss ideas for planning events and offer feedback. Building partnerships was a goal of Mayor Aultman’s when the annual “Back to the Bricks” event was created. The event brings together the City of Clinton, Chamber of Commerce, area businesses, Mississippi College and Main Street. She is constantly looking for ways to draw positive attention to the city, and through her involvement and support of the Main Street programs and events, Mayor Aultman has raised a heightened sense of community and volunteerism in the small town. The City of Clinton’s mission statement is: History, Pride, Progress and Mayor Aultman has been instrumental in bridging the gap between history and progress at Main Street Clinton. It seems that every downtown has that one special business that draws customers from near and far. The one that you always want to shop because they have the best of everything. . .customer service, selection, a friendly staff and accommodating hours. In Philadelphia, that business is Steve’s on the Square. Not only is owner Steve Wilkerson a successful businessman, he is also a charter member of the Philadelphia Main Street board of directors, and most recently served as chairman of the Community Development Partnership board of directors. Located on the square in downtown Philadelphia, Steve’s is celebrating its 29th year. It was 1983 when Steve opened the doors, and he has continued to work hard to become a leader in men’s fashions and is fast becoming known as a destination for women’s clothing as well. Steve realizes that in today’s market you have to be specialized, but also broad-based enough to attract customers from all segments. The staff at Steve’s on the Square is second to none. You will always be greeted with a smile and a “come in”! They are continually searching for collections or items that will make Steve’s an even better place to shop. In 2009 and 2010, Steve’s received honorable mention in Mississippi Magazine’s Best of Mississippi edition in the Best Men’s Store category. Steve’s on the Square has won numerous awards in Main Street’s annual window decorating contest at Christmas. His windows are creative and welcoming throughout the year, making customers want to venture inside. Steve is a dedicated volunteer at Main Street events, such as the annual Ham Jam Arts Festival and Christmas parade. Steve’s on the Square also participates in every promotion sponsored by Main Street, because Steve knows the value of hosting special events downtown to attract customers and keep downtown vibrant. This award is presented annually to Main Street Managers who have shown excellent service to their communities and downtown programs. Three Main Street Managers will receive a $500 scholarship to attend the regional “Destination Downtown” conference. Established in 2012, the award comes from nominations from the District Directors of MMSA and is supported by proceeds from the annual scholarship auction. When asked about the progress of Main Street Clinton, Tara Lytal says she instantly feels pressure to come up with something huge or impressive, when in all actuality, Main Street accomplishments and goals are often not huge, but their cumulative effect is impressive. The cumulative effect of many small projects and events can be easily seen on the streets of downtown Clinton today. Since the Main Street Clinton program began in 2007, Tara and her board and volunteers have been busy with the business of revitalization by bringing positive attention to Olde Towne and Clinton Boulevard, Clinton’s two oldest commercial districts. With many events, beautification efforts, an aggressive business recruitment plan and many commercial projects happening throughout the city and Mississippi College expansions, 2012 has already been a very busy year. Over the past few years, Main Street Clinton has held events such as Cruzin’ the Boulevard, the award-winning Caterpillar Parade, Movin’ on Main Street, Olde Towne Markets and the Holiday Market, and the award-winning Back to the Bricks. All of these events are designed to build downtown awareness and to drive traffic to the districts. There has been increasing interest from investors looking to both Main Street districts for commercial development opportunities. Main Street Clinton has also adopted an improvement project for Lion’s Club Park, a partnership with the Lion’s Club, City of Clinton, and Mississippi College. Tara works well with the city and other organizations in the community to accomplish these events and projects, understanding that partnership is key to success. Always forward thinking, Tara constantly evaluates and works to improve existing events and asks her board, volunteers and the public for feedback and new ideas. Tara is interested and concerned with every building and existing business in the Main Street districts, and she meets every challenge with a goal and a plan. Tara has a quiet, gentle spirit, keen insight and superb taste. She never neglects any detail, a quality that surely stems from her background in interior design and retail merchandizing. As everyone here from Clinton would agree, Tara is a joy to work with and someone you want on your team. Under the direction of Tara, Main Street Clinton continues to work hard to improve its community and to promote the authentic, unique character of Clinton. MMSA honors Tara Lytal with our first Excellence in Main Street award. Though still relatively new to Laurel Main Street, Judi Holifield hasn’t missed a step from the start. With a dedicated board and volunteers, Laurel Main Street had a seamless transition between directors, and Judi has taken her skills and connection to the community through the Arts Council to benefit Main Street. In the past year, Judi has taken the successful Main Street program, which began in 2008, and helped it soar to a new height. Since its inception, Laurel Main Street has fostered much growth in downtown Laurel, including 35 new service and retail businesses, 115 new jobs, 10 business expansions, more than $3 million in private investment, 15 façade improvements, and 15 building rehabilitations, two of which won Design Awards. Laurel Main Street has been active in securing grants, including: a Tree Grant, Energy Grant for Street Lighting, and a Walking Tour Brochure Grant. Physical improvements have been made to parks and vacant lots, and benches, trees and flower plantings have beautified downtown. There are 23 occupied downtown apartments and all have waiting lists. Sponsored and co-sponsored events for LMS include: the Chili Cook-Off, Farmer’s Market, Third Thursday Live Music, Downtown Movie Night, Cruisin’ Main Street Car Show, the award-winning Loblolly Festival, Charlie Brown Christmas Jazz Concert, December Downtown, Artwalks, Trustmark Park Lunch Concert Series, Laurel Little Theatre Children’s Production, and events for youth. Judi catalogs all of the projects, news and events and investment opportunities in downtown by continuing to send out the award-winning LMS newsletter weekly. Judi has already been a stand out with her leadership and new ideas, such as Laurel Main Street’s successful “Open Doors” fundraising campaign this year. By jumping in and throwing her creative spirit, energy and work ethic into downtown Laurel, MMSA would like to recognize Judi for her excellent work as a bright, new star on Main Street. John McClure has been involved with the state coordinating Main Street program since its origin in Mississippi in the mid-1980s. Established in 1985, Meridian was one of the first Main Street Communities in the state of which John was a founding member. In 2010, John stepped in as executive director of the Main Street program in Meridian. Under his leadership, the Alliance for Downtown Meridian was revamped and renamed Meridian Main Street. As part of the effort to educate the public on the organization’s purpose and mission, John and his staff launched a branding campaign to build support and expand membership. He quickly identified strategic goals for downtown, including renaming Fifth Street to Main Street, where the Meridian Main Street office is located. To educate and engage the community, John and Meridian Main Street created an engaging annual report that won Best Image Promotion in 2011. With the influx of new developers, entrepreneurs, businesses, and the expanding Mississippi State Meridian Campus, downtown Meridian has really come alive. Under John’s direction, Meridian Main Street has been a visionary leader in the progress of downtown revitalization, including award-winning development projects. John solicited MSU – Meridian to conduct a downtown residential study and followed the study with a workshop for potential developers. Meridian Main Street also developed the award-winning Nexus Hero workshops for online entrepreneurs and hosts many other events, including the downtown art crawls (including one just for the kids), Earth’s Bounty downtown Farmers Market, downtown cleanups, and even a Mardi Gras party. Besides promoting Main Street events, John does an excellent job cross-promoting other events in town and partnering with and supporting other organizations. In return, John has secured many sponsors and partners for Meridian Main Street. John also engages his board members to be knowledgeable and involved in the state Main Street program, bringing members to training events and hosting the state Main Street training at the Riley Center last fall. John is a tireless advocate for Meridian Main Street and downtown Meridian. Progressive and visionary, John aligns himself with the best and brightest people and businesses to get the job done. The hustle and bustle in downtown Meridian attests to the rebirth and success of Meridian Main Street and John’s endeavors. MMSA congratulates John McClure for his numerous years of service and for breathing new life and vision into Meridian Main Street and downtown Meridian. Charles was one of the founding board members of MMSA and served on the Board and in various officer positions, including President. “Charlie” was Board Member Emeritus at the time of his death in 2007 and had served Main Street since it was founded in 1989. This award is a $1,500 scholarship to attend the National Main Street Conference, given to a Main Street Manager who has shown outstanding service to their community and program. The scholarship is awarded annually and nominations must come from the District Directors of MMSA. Proceeds from the Scholarship Auction support the annual Charles Beasley Scholarship Award Fund. Since the designation of WVMSA in 2007, of which he was a founding member, Mickey has been an active and involved board member and volunteer until he became WV Main Street Manager, better known to many as “The Man,“ in 2009. Hearing Mickey speak, one quickly realizes he is no native of Water Valley. After getting used to his N’oleans drawl, one is quickly drawn to Mickey’s open and candid demeanor and his undivided attention with whomever he is speaking. Mickey’s love of travel and adventure has taken him to Main Street towns and cities all over the state and country to see what other Main Street programs are doing. He is always willing to listen and share his fresh ideas and opinions. Mickey’s approach to downtown revitalization places great importance on the physical place – restoring and re-developing existing buildings in downtown. He said WVMSA now counts progress by how many construction dumpsters are in downtown. Since 2007, several buildings have been purchased and renovated in downtown Water Valley, including a coffee shop, dance studio, hair salon and two restaurants. Mickey and his wife Annette have quite a bit of “skin in the game” themselves, as they bought and are currently in the process of restoring an 1880’s building downtown that will include a residential component. On the bottom floor, Mickey and Annette manage Bozarts Gallery, which hosts about 8 art shows a year as well as “open mike night” poetry readings, WVMS fundraisers and other events. They also rehabbed the 1912 bank building that is now the Water Valley Main Street headquarters. Mickey’s commitment to proper historic rehabilitation is apparent. Working closely with MDAH and MHT, the Water Valley Main Street Historic District is now officially listed on the National Register of Historic Places. Word about WV has literally spread around the world. Features in the North Mississippi Herald and Memphis Commercial Appeal were followed by national media attention. The New York Times introduced us to Erin, Coulter, Megan and Alexe… the “movers and shakers” of Water Valley, who according to the headline, have “Made Main Street Their Own”. These young entrepreneurs (among others) are part of a growing creative sector who moved to WV and renovated houses and several storefronts, including the award-winning BTC Grocery and Yalo art gallery, with the help of low-interest loans and facade grants from WVMSA. As if the national attention wasn’t enough, the news about WV has also gone international. The magazine Bundpic based in Shanghai, which calls itself China’s magazine for politics, art and culture, published a six-page feature on Water Valley. For any of you who read Mandarin, Mickey has a printed copy of the article in his office. With Mickey and his hardworking team, the future of Water Valley is exciting and promising. Creative entrepreneurs and artists continue to pour into WV, transforming the once-sleepy small town into a thriving cultural and arts destination. The “affable New Orleans transplant” as the New York Times called Mickey, is truly a person you cannot help but like. Past careers as a shrimper, technician, teacher and business manager have prepared Mickey for the diverse hats a Main Street Manager wears. He has said more than once, that at a future main street training all the managers (and keep in mind, the overwhelming majority are ladies) need to put on steel-toe boots, grab sledge hammers and get into the gritty work of restoring a historic building. One of these days, Mickey. Besides getting gritty restoring old buildings, Mickey has helped direct several projects and events that have won state Main Street awards, including: a Chair-ity Auction, the Better Back Street Project, the “Come As You Aren’t” Costume and Dance Party fundraising event, and the very popular Downtown Art Crawl. As no surprise, Mickey has been placed on the unofficial Main Street speaking bureau and has spoken at several Main Street conferences as well as other community and economic development conferences and events across the state presenting on best practices from Water Valley. He is always quick to acknowledge that every success has been a total team effort. Mickey is completing his second year as manager’s representative on the statewide Main Street board of directors. He has taken the confidence of his peers seriously and continues to reach out and assist other local programs, acting as a voice for the managers to our staff and board. … Four years ago,… there were 18 empty storefronts. Now there are six. … this is… a great story of resurgence when the national economy has been at its worst. They are breaking the mold about the who, what – and how – of downtown revitalization. While the people and personalities involved here are definitely on the cutting edge of sustainable community development, their tools are the bread-and-butter of many downtown programs… good organizing, solid data, and some small incentives… which goes to show that when put in the right hands… make amazing things happen. So it all works together… local… state… national… and back again. And while we can take no direct credit for Water Valley’s success, I am proud to be part of the national movement, where a solid methodology, network of partners, and creative personalities are literally becoming the “change we want to see” in the world. Loescher’s last remark was taken from the quote behind BTC Grocery - BTC stands for: Be the change you want to see in the world. Mickey, that statement is no truer for anyone than you. WVMS has perfectly demonstrated the power of the Main Street model in the right hands. Thank you, Mickey, for inspiring, encouraging and directing these efforts and for exemplifying the Main Street mission every day. MMSA wants to recognize Mickey for his absolute dedication, passion and commitment to not only WV but to the whole state and network of Main Street Communities. He has truly influenced and impacted our staff and his fellow managers, WVMS and many others. Please help us congratulate Mickey Howley, this year’s recipient of the Charles O. Beasley Scholarship Award for Outstanding Main Street Manager of the Year.